Josh’s musical interests reside somewhere in the middle of jazz, free jazz, avant garde, contemporary classical, folk, improvisational, rock and electronic. 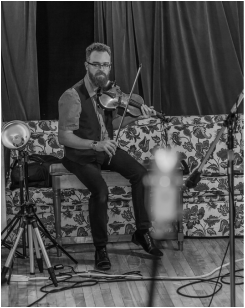 Mainly, Josh is a performer/composer fusing many means of styles through the studies of electronics and the violin. Along the way, Josh has played with numerous different groups and individuals. Some collaborations were with Chad Van Gaalen, Lori Freedman, Philippe Lauzier, members of Bell Orchestre, Pierre-Yves Martel, Michael Blake, Bernard Falaise, Rainer Wiens, Michel F Coté, Sam Shalabi, Miles Perkin, Myra Melford, Marshall Allen, Fred Frith, Matana Roberts, Jean Derome, Malcom Goldstein, Pierre Tanguay plus many more groups and individual players. Josh has played the Montreal, Calgary, Medicine Hat, L’Off Festival de Jazz de Montreal, Jazz festivals, Suoni Per Il Popolo, Sound Travels (Sound Art Festival in Toronto), Festival de Musique Actuelle de Victoriaville, Guelph Jazz Festival, Osheaga, Pop Montreal, NXNE, as well as numerous festival circuits in Europe.